NEW WEBSITE. NEW TRAILS. WELCOME. Welcome to the place where we appreciate and curate barn quilts in Canada. Explore this website and connect. Maps for the explorers. Instructions and videos for community organizers. Social media to show our appreciation for rural art. Enjoy..
Professional painters Lindsay McKay, at left, and her mother Cheryl Gardiner. Her daughter, Lindsay McKay, has joined the enterprise. Gardiner’s Gate Custom Handcrafted Barn Quilts is located at 16050 Ilderton Road, and can be contacted at 519-461-9344. Or visit them on Facebook. — Special to the St. Marys Journal Argus, Aug 04, 2016. Click here for entire article. Tim and Donna Prior, the owners of Brussels Agri-Services and The Cowboy Loft put up $750 for the county’s best barn quilt and $250 for the fan favourite in a competition encouraging residents to spruce up their barns with a barn quilt. All part of the International Plowing Match 2017 in Huron County. The 150 plus barn quilts created for the IPM Sept 2017 are now the Huron County Barn Quilt. 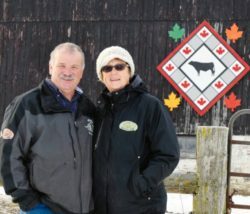 Tim and Donna worked with Gardiner’s Gate of Ilderton for their design, a Canadian flag, four maple leaves depicting the fall season and a mural of a Wagyu cow, the type of animal the Priors have on their home farm east of Brussels. In an interview with The Citizen, Prior says that he first encountered a barn quilt when he was in the Glencoe area, travelling for work. He saw how the barn quilts could be a lasting reminder of the plowing match, beautifying the landscape for many years after the event. Link to newspaper article written by SHAWN LOUGHLIN in The Citizen, published in north Huron County, Ontario, Canada. Also preserved here. Ten years ago Denise Corneil and Mary Simpson came together to save the little town of Wardsville in southwest Middlesex County. In doing so, they sparked one of the most defining motifs in modern small-town Ontario: barn quilts. Denise Corneil and Mary Simpson, the Barn Quilt Ladies. Tireless promoters and determined to curate all of Canada’s barn quilts! Corneil and Simpson grew up together many decades ago, across the street from one another between Woodgreen and Strathburn. Corneil was raised on a tobacco farm and Simpson a poultry farm, both with an affinity for small-town culture and camaraderie. It was the camaraderie that brought them back together; it was the small-town culture they were trying to save. 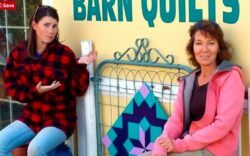 What started as 30 barn quilts in Wardsville quickly became 60, and then over 100 as the provincial government picked up on the initiative. They helped fund this website, barnquilttrails.ca, a place to look up the many barn trails across Ontario.